Welcome to this week’s edition of On The Farm Friday! 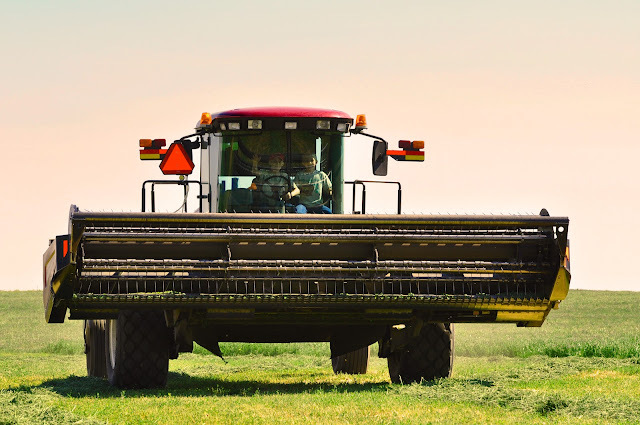 Now that wheat harvest is over, my two older boys, Benedict and Andrew, are focusing their energy on every open opportunity to run the swather for their grandpa. Whenever alfalfa or wheat straw is on the schedule to be cut, they want nothing more than to get in on the action. I love that they are rising early on their own. They hustle out to feed their bucket calves and return to the house for a heaping bowl of cereal and a gathering of supplies for the day. While I assemble their lunches and water jugs they take turns explaining to me (as recent experts in the knowledge of swathing) all the ins and outs of running the machine. They even express how beautiful and full the circles of alfalfa look, and how much fun it is too be out in the middle of the blooming fields. My heart always swells a bit when they give me glimpses into their worlds - their hearts, their imaginations. Such a joy! As for the younger brutes of our bunch, while they love having full run of the house and act as captains of the Legos and Nerf guns, they really do miss their older comrades when they are gone. The schedule of work on the farm is always unpredictable. Sometimes the boys are out in a field for several hours, other times it’s only one or two. When they come home, it’s a big uproar of wild excitement....wrestling, jumping off furniture, and relentless teasing - like they haven’t seen each other for ages. As I was snapping pics and trying to stay out of the line of fire, I kept thinking about how different the view through my lense would be if we had girls. While the boys didn’t even take time to kick their boots off, the girls would most likely still be prancing around the house trying to find their perfect swimsuit. Then, they would have to make sure that their toe nails were polished, flip-flops matching, and hair put up in a perfect pony. For the boys it’s all about seizing the moment, engaging in the battle. They are free, wild spirits, bonding as brothers in a moment of sheer spontaneous ramble. It's pure joy - for me, and for them. I hope that they will always remember these times.